ATLANTA : Georgia Knanaya makkal is all set for their much awaited Onam celebrations on Sunday August 29 in the community center. The Malayam school teachers who are organising the Celebrations is thrilled by the enthusiasm of their children in putting up Malayalam cultural programs such as thiruvathira, folk dance, nadan songs and Vanchi pattu etc. 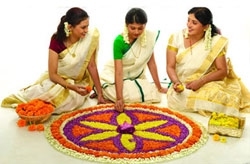 Onam Sadhya is organised by the women's forum executives who are happy with the response of their members. KCYL & kids club is also organising their own out door fun games for their members. President Joseph Elakat said that the speciality of this year onam celebrations will be Puliattom and Kilikkikuth along with the normal Chendamelam, Maveli & Vallam kali.